I always thought that I would marry someone Jewish. It seemed like a given; USY and Hebrew school classes were sometimes dedicated to teaching us about the challenges of marrying outside the faith. I was on board, and my beshert would surely be Jewish. My true love would naturally have an affinity for my first love, Judaism. Well, I didn’t stick to only dating Jewish girls. I frankly didn’t find myself more or less attracted to someone just because they were or were not Jewish. I told myself that when it was time to settle down, I would find a Jewish girl then. A few years after college, a friend urged me to get on JDate because she was concerned I was getting close to that settling down time. I met a lot of wonderful Jewish women through JDate, but unfortunately, none of the relationships clicked. Then I met Rose. We shared an office together. She was new to Chicago, so I thought I would be nice and invite her along to hang out with my friends. I liked that she was easygoing about everything and always content to just come along and be present. Others eventually began to wonder what was going on between us, and over time, I did too. So I asked her out. I found Rose to be beautiful and patient. She provided me with a sense of calm and peacefulness when we were together and taught me to appreciate the simple joys of life. One Sunday night after a long and exhausting weekend of skiing up in Wisconsin, we got home and she baked cookies. I asked her how she could possibly have the energy to bake cookies, and she said she had been thinking about and looking forward to baking them the whole ride home. I knew she was perfect for me, because she challenged me to take time, relax, and just enjoy the small things, like the smell of baking cookies. But Rose wasn’t Jewish. So I decided to make my intentions known early, around our second or third date. I matter-of-factly explained that I was Jewish. I did Jewish things like keeping kosher and going to synagogue. I had been raised to marry a Jewish woman and was planning to marry a Jewish woman. She turned her head away and wouldn’t look at me and I felt a pit in my stomach. What made perfect sense in my mind a second before suddenly felt more complex, and I worried we might be ending things right then and there. After a long silence, she told me that I needed to figure this out in a tone that signaled almost as much confusion as disappointment. She didn’t feel that it was fair of me to wait for her to convert to Judaism before allowing myself to see our relationship as something serious. Rose was right. I was setting up the rest of our relationship on a conditional basis. If she was not Jewish, it would not work; if she was Jewish it would work. But in her patient, loving way – or perhaps just because she knew better than me – Rose gave me time to figure it out. And time turned out to be the best thing for me. The longer we were together, the more I questioned why marrying someone Jewish was an absolute must for me. 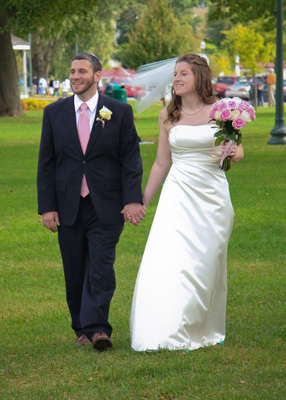 Since we had started dating, I had become more active in synagogue life, Jewish observance, and had even started working for a Jewish nonprofit; she hadn’t inhibited my connection to my faith. 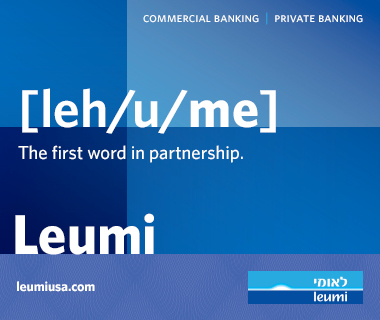 As I grew and our relationship unfolded, I came to understand that more than a Jewish partner, I wanted a Jewish home. Granted, the task of building a Jewish home is simpler with a Jewish partner, but I was beginning to believe that it wasn’t a requirement. Rose and I were living together, hosting holiday and Shabbat meals and attending Jewish events where Rose had even learned to follow along with some of the blessings and prayers. If she could be on board with being an active partner in building this Jewish home, then I could accept that she may never become Jewish herself. When I shared this with her, we went through the difficult task of really clarifying what that meant for both of us. This meant, for example, that I needed her to be there on Friday night when we sat down to Shabbat dinner as a family. For her, it meant I couldn’t disown our kids if they made different choices about how to observe Judaism. For both of us, it meant building a home where each of our family values and traditions was respected and honored. It was an important and difficult conversation for us to have. Sometime after that conversation, I came home on a Friday afternoon to find myself barred from our kitchen. Rose said to stay out because she had a surprise for me. Curiosity got the best of me, however, and I wandered inside. The first thing I saw was an empty mixing bowl and several measuring cups in the sink. Up on the counter were a half-empty bag of flour, a bottle of oil and eggs. Then I saw Rose, rolling dough into long strands and braiding them together. 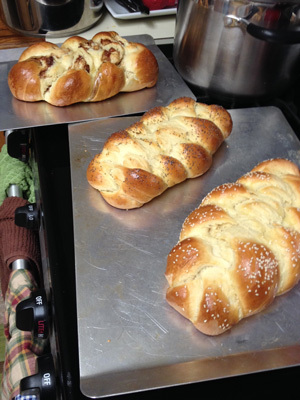 She had gone online and taught herself how to make challah from scratch. In that moment, I knew that she understood what I needed in an active partner for my Jewish home. That was the day I decided I would marry her. 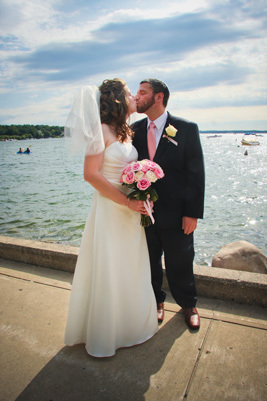 Today, as an interfaith couple married for more than three years, we continue to work on the process of defining what it means to build our Jewish home together while respecting and honoring both of our traditions. I’m still Jewish. I’m no less Jewish than I was before I met Rose. Rose is still not Jewish and has become no more so than before she met me. It is my belief that you either identify or don’t identify with Judaism, or any religion for that matter. Whether someone is born into a faith or converts into it, at some point, they still must choose to believe. You can debate the boundaries of what it means to be or not to be Jewish, you can identify a continuum around observance, but observance doesn’t define religion. I don’t become less Jewish because I break a mitzvah any more than Rose becomes more Jewish by completing one; this doesn’t stop us from building a value system and creating traditions for our family rooted in that understanding. Friday nights, we say kiddush together because welcoming Shabbat is an important event for me. We also visit with Rose’s parents on Christmas and exchange gifts because spending family time on the holidays is important to Rose. Through it all, we still use the same challah recipe, printed on the exact same paper from the day she first made it. It’s the most requested item on Shabbat and the holidays by all of our friends – Jewish and non-Jewish alike. 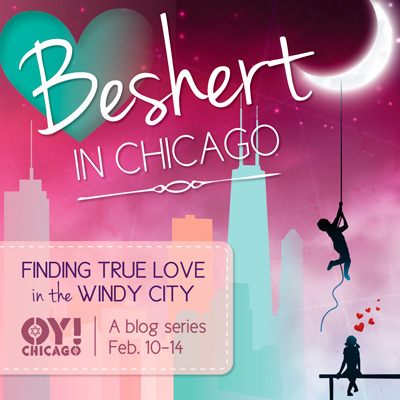 For more posts in the “Beshert in Chicago” series, go here.